A few bits of skincare have really impressed me recently, fixing my skin and getting it back to normal after a previous product broke it out on my forehead (where I rarely get any blemishes). I love products that restore the balance and bring your skin right back to the way it should be! The above tick those boxes perfectly, so I’ll give you a little rundown of the things I’ve been loving. First is the Dr. Andrew Weil for Origins range, which is a new one to me but I adore it now! 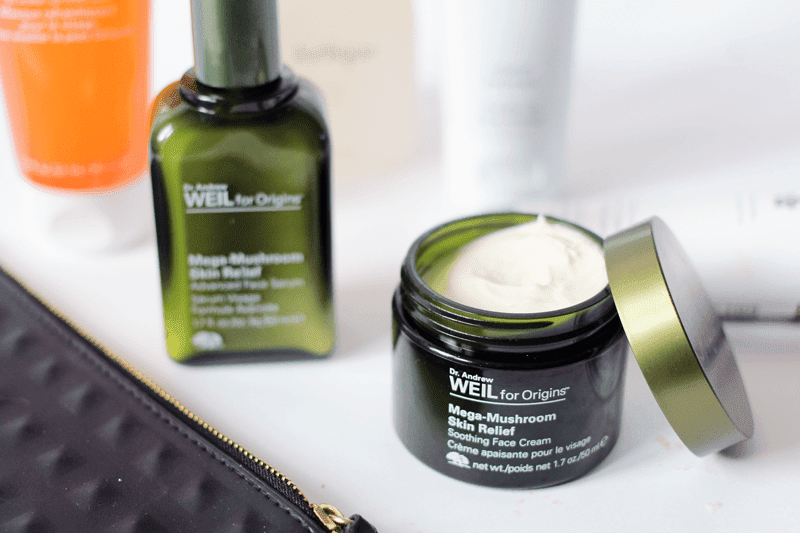 I’ve been using the Origins Mega-Mushroom Skin Relief Advanced Face Serum and the Origins Mega-Mushroom Skin Relief Soothing Face Cream for a few weeks now and they do what they say on the tin. They soothe irritated skin, restore moisture and leave skin feeling so comfortable which is something I always look for with my sensitive complexion. Gorgeous products! 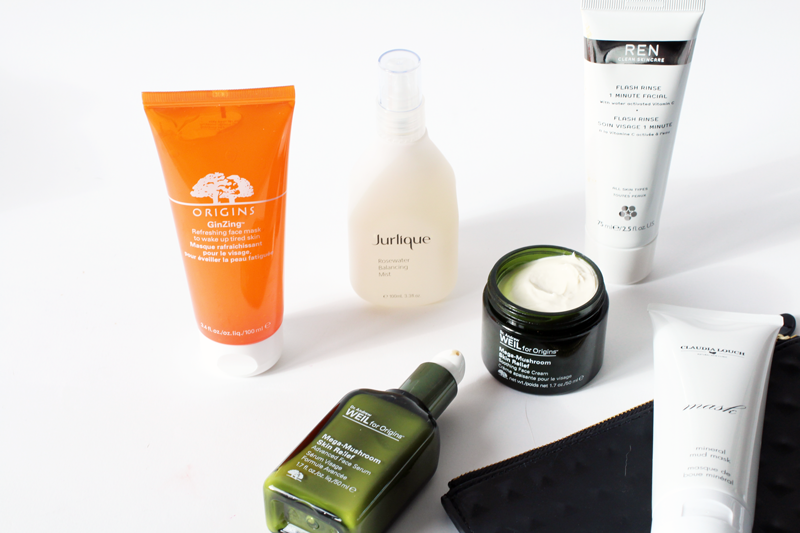 Another product from the brand that’s impressed me is the Origins Ginzing Refreshing Face Mask. This works in 10 minutes to give skin a bit of a boost, instantly brightening and refreshing, as the Ginzing range is famous for. It’s great as a pre-night out or date pick me up! Continuing down the brightening line, I’ve been waiting for the REN Flash Rinse 1 Minute Facial to be released since I got a little preview test sample months ago. This stuff is seriously powerful, working (as it says) in just one minute to leave skin radiant and glowing – perfect for AW when skin starts to look a little dull! Speaking of dull skin, after my skin broke out it was also left a little lacklustre and congested looking. So, I’ve been adoring the Claudia Louch Mineral Mud Mask to bring a bit of order back to my combination complexion. You don’t have to leave it on long for it to leave skin looking more clear and balanced! Finally, another product which has helped my skin is the lovely Jurlique Rosewater Balancing Mist. Firstly, it smells divine and secondly, it works marvelously well to give skin a boost of moisture whilst calming it down and works well before my moisturiser. I adore Jurlique (see a brand overview here) so I’m not surprised I love this too! What skincare have you been loving recently? Make sure you check out my blog sale! Ends Monday.